What is Zigit Bakole School? 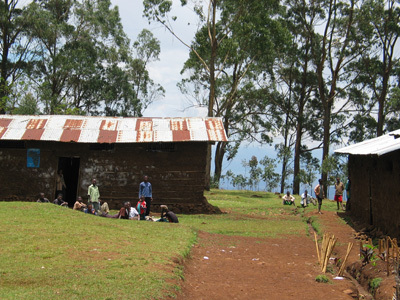 A primary/secondary school in rural, mountainous southern Ethiopia that had 1400 pupils this past year in its Grade 1 to Grade 8. Why and how did you become involved in it? Because the Ethiopian government can only partly fund these schools, and expects the local communities to fund the rest. But Zigit community is poor, and the school’s board welcomed external support. And you helped the school by donating school desks, either through gifts at Hanny and Hans' farewell parties in January, or by specific contributions. Recall the complete history of the school desks support action here. The budgeting and implementation processes are quite different from what we are used to. The school’s size is determined by the estimated number of pupils that will register the next year. Education from age 7 to age 14 is compulsory. The estimates for the school year 2001 (Ethiopian new year is on 12 September this year, when the Milennium Year 2000 will end) are that enrolment will be 1800. This means that at least 4 new classrooms have to be built. Classrooms, furniture, and day-to-day materials are to be funded by the local community. Classrooms are simple constructions of wood, filled and plastered wit clay, topped wit corrugated iron, with a concrete rim around the foot of the structure preventing the soil to wash away. The Federal government determines, appoints, and pays the number of teachers according to the number of classrooms in use. It also provides text books, but too few of them (in the best case one per 3 children, sometimes none), and not necessarily at the right moment (eg after a curriculum change, or even at the start of a year for an increased number of pupils). In our April reviews with the school’s board and the local government instances (the Kebele, for the village and surrounds, and the Woreda, the next level up), we agreed that the most needed support now was school desks. In April also, another VSO volunteer couple that we took up to Zigit became interested and involved in the school. Rob, as an English language teacher in the ELIP program (English Language Improvement Program) at Arba Minch Teachers Training College, attempts to obtain text books for English (the only ones present were teachers’ copies) and organizes short workshops for the English language teachers of the school (and for those teaching other subjects in English) to improve their own English. And were the desks manufactured and supplied now? Yes! See some of them proudly populating classrooms. It has taken a while, and some sweat and organizing power of both ourselves and our Ethiopian helper, student Assefa of Arba Minch University. Assefa is now graduated from the Water Technology Institute of AMU, but still works with us on the ‘after sales’ activities related to the carpenters that made the desks. Also Zigit’s (in April) acting headmaster Habtamu has helped much. You can see here how the manufacturing process created an ever increasing number of steel frames, that were piled up in the open air in front of the carpenters’ workshop. The workshop doubles in times of Champions Leage football matches as open air television area, admission 1 Birr. Ethiopians are very engaged in English football, and the name ‘Arsenal’ is proudly carried by buses as their destination, is painted on table tennis tables (Man United on the other half), and pops up on t-shirts. 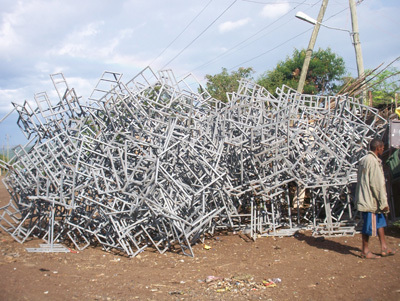 When the pile was as big as in the picture to the right, a small problem arose: the Woreda had promised to organize and pay for the transport up-mountain, before the final assembly would take place in Zigit – but it took a few weeks and negotiations to make that actually happen. Fortunately their cost-reduction plan of transporting all frames in two trips was not carried out. Look at the Isuzu under those load circumstances – it would not have reached Zigit without accidents had it really departed like that. The next apparent showstopper was power supply in Zigit. The whole country suffered a two-days-on, one-day-off scheme for electricity supply due to water shortage at the hydro-electric plants – but Zigit had, on top of that, additional cuts of many days. The carpenters practically gave up mounting the desks for weeks. Desks remained in parts for a while in Zigit (not in the open air as in the pictures; where you can also spot some damage by the daring transport efforts). Meanwhile those desks that were ready were put to some use already in the Grade 8 examinations, and in the celebrations associated with the end of the school year in June. The contract then spoke about a last coat of paint to be applied to the metal. Here, the carpenters had great difficulty getting the work done right, sending some young boys up with not enough paint and taking their word for having finished the work. That episode was also good for a few weeks delay. We have decided that it is better not to argue and push, but instead buy paint and brushes ourselves, and hire Zigit people to do the painting after thorough instruction about cleaning first, brush usage, etc. (imagine! who in our countries has not ever painted something himself!). Therefore, last Saturday in a checkup with one of the carpenter’s associates in Zigit, we agreed that the only work left was to correct 20 desks which were technically not up to standard. When that is appropriately finished in (promised!) two weeks time, we will pay the last installment. Meanwhile, Hanny will supervise the painting process in the coming week. Consider it done! The total cost of the 250 desks was 5820 Euro. The first amount received was approx 900 Eur from gifts at Hans’ farewell at work and from family and friends upon departure. Together with our own initial contribution, we received after our weblog posting and email a further 3350 Eur. Then Projectline Inc from Seattle jumped in with a donation of USD 8200, taking us well above the required amount, enabling further work for the school to be soon undertaken. We are discussing the school’s planning for ‘2001’ to see which efforts are most urgently needed – and will come back here to tell about it. Were the people happy with the support? Most impressively so. The response was actually a bit over the top. The school and the Woreda organized what they called a ‘reward ceremony’. In Ethiopia, ceremonies are essential and frequent. The simplest is the coffee ceremony, good for a few hours, three good cups of coffee, freshly made popcorn or qolo (roasted barleycorn) and a nice smell of incense. This ceremony was quite elaborate: we were actually quite embarassed by the amount of effort (and to a certain extent money) our hosts had thrown into the event. But: ‘it is our culture, you will have to accept’. Some elders of the Kebele came to celebrate, and there were debates on ‘the responsibility for the quality of education’ and other issues, in which everyone including us had to throw in his or her contribution. Moreover, there was food for the elders, the teachers, and us, the guests: the national festive dish, doro wat, chicken in a tasty spicy sauce. 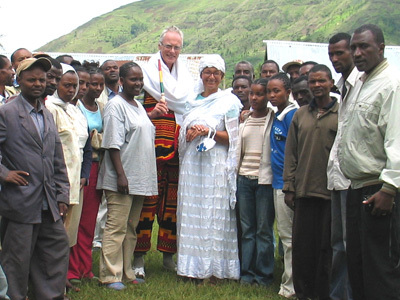 And presents – we could not refuse to dress in cultural attire as was given to us by the Woreda representatives. To make you attend the ceremony somewhat too, here are a few pictures. The Woreda staff explained that government policy is to build more schools, in more locations, with smaller classes. Evidently there is not enough money for the policy yet, because Zigit Bakole school will grow next year to accommodate all pupils from its current area. So we shall consider the school’s needs for the coming year and see where we can fit in. Thanks to all of you who contributed to the desks!